Over 50 years of metalworking experience! Click to download the D&G Machine Metal Fabrication Facilities List. 58 tooling stations, 33 tons of punching, 2 auto-index stations, abs tooling, handles sheet sizes up to 50" x 144"
with two axis gauging for short runs and prototypes. Capacity 1" dia thru .25" steel with .005" accuracy, sheet sizes to 30" x 39"
for insertion of fasteners, power settings of 1,200 to 12,000 lbs. Equipped with auto-feed. Welders are certified to ASME, AWS, NAVSEA. 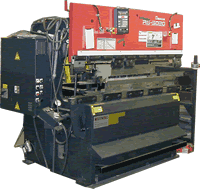 Click to download the D&G Machine Welding Capabilities List.